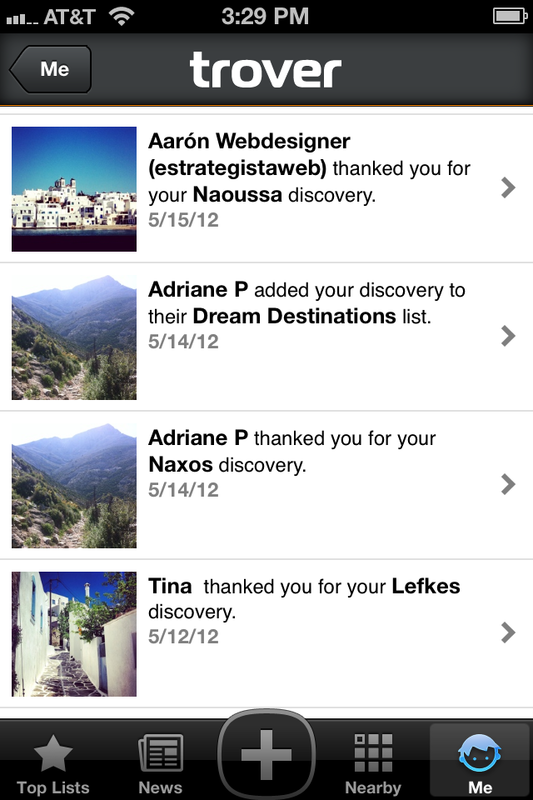 When Trover arrived it was a tool for friends to recommend off-the-beaten-path travel destinations. But a few months ago, CEO Jason Karas noticed that his users weren’t friending their real life friends on the service that often. And they weren’t building itineraries as much as tabulating beautiful architecture or beaches they wanted to see someday, pulled from photos uploaded from all over the world. The collections weren’t, in other words, immediately practical. They were far more aspirational. Those stats show that in the past 45 days, when Trover had begun testing out some updated features (more on that in a minute), page views were up 35 percent, and in the last year, up 300 percent. And, as Karas explained, those are the norm now, not the exception. The number of lists created every day has doubled in the last month. And at least half are these kind of aspirational or pleasure lists. To respond to its users’ wishes, in July Trover started rolling out subtle but important feature changes. These include giving a human editor the job of populating the app’s landing page with the best or most interesting content on Trover to pull users in right away; improving the search function and making it prominent so users can immediately jump to a location or group of images they may want to browse; and adding the ability to scroll through full-screen photos more fluidly — previously you had to click on a photo to view it full-screen and close it before advancing to the next photo. This is all actually good news for Trover. As anyone working in online travel search or making a travel tool knows, it’s a really, really hard business. Because very few people are always looking for a discount flight. No one is always planning a family trip to Disney World(s dis) or a honeymoon or a road trip. So it’s really tough for new, small companies that are not named Kayak or Priceline or Orbitz to get a foothold because they have to constantly try to engage new users over and over again. That’s why moving from being a tool that people only use to plan trips to an app people use to build collections of things they like (a la Pinterest) and engage in because they feel a part of a particular community centered on exploration, is a stroke of luck for Trover. Sure, it has to compete with the Pinterests and the Instagrams of the world for places people go to kill time or discover new things. But if it is able to eventually grow its user numbers beyond the 200,000 it has right now, they’ll be able to sell ads that are highly targeted because each user is giving them so much information about the things they like and the places they want to go. And they have time. Trover was spun out of Travelpost, another Seattle-based travel company, and has the funding to tinker around while it finds its sweet spot. To engage Trover users even further, the company does have more new features planned very soon, including lists that multiple users can contribute to and a desktop web portal so users can upload images not currently on an iPhone(s AAPL) or Android(s GOOG) device.